When you live in a foreign country, the first thing you are faced with is CULTURE. In Indonesia, the culture is very different - and that’s when the challenge begins. Living in Indonesia is a big challenge to westerners. The culture, religion, attitude to life and daily behavior differs greatly from western countries and this is exactly where the challenges lie. With this cross-cultural workshop you can prepare yourself and your family best to live and survive in Indonesia. 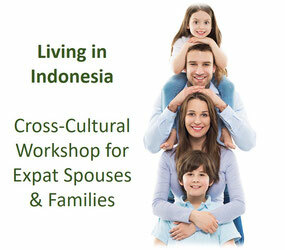 The workshop is designed especially for the needs and topics of spouses of expatriates coming to Indonesia first time. During the workshop you learn about the big cultural differences and develop your “daily survival kit” for living in Indonesia. Our trainers are experienced intercultural experts having a broad experience about local culture, behavior, living and surviving in Indonesia. The workshop will be held by a local trainer and a expatriate trainer. Send us a message if you are interested in this workshop and we will inform you once the new dates are available.